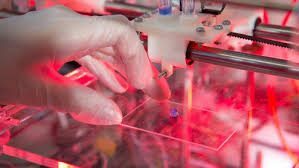 Bioprinting has the potential to revolutionize the drug development industry by expediting the process and reducing costs. As all drugs must be rigorously tested before they can reach the market, development times and costs can quickly escalate during the process 1,2. A gap exists between 2D cell culture toxicity testing and the use of animal models where bioprinting can make an impact. Researchers have been working toward developing engineered constructs to mimic disease states and physiological organ systems in order to better analyze the effects of drugs on mammalian systems to better screen drugs prior to animal testing. One popular approach for drug testing has been the use of ‘Organ on a Chip’ devices. “Organ on a Chip” devices contain several millimeter to a centimeter wide constructs that mimic the functionality of a full-sized organ3. These organ mimics are arranged within a microfluidic device so that different organ systems are connected to each through a ‘vascular system’ comprised of channels. With advanced microfluidic systems can drive pulsatile fluid motion, valves, and other anatomical components to best mimic native physiological function such as a pumping heart, breathing of the lungs, peristaltic motion of the intestines, etc. 4. Basically, these are models for in vivo organ systems that drug interactions can be tested on and other experiments conducted on. Once the technology reaches maturation, these “Organ on a Chips” could replace the need for animal testing due to their replication of the major organ systems of the body. However at the moment, the technology is still in its infancy. One could envision a chip containing an engineered skin as the drug delivery mechanism for testing micro-needle patches and ointments. Also could be utilized for cosmetic testing to test toxicity of compositions. The skin would immediately connect to the vascular network which would connect to the liver, kidney, and spleen at a basic level to evaluate clearance of the drug. Additional organs could be added depending on what the drug is intended to treat or what side-effects there is an interest in testing. A fully functional digestive system could be engineered to study absorption of a drug from different capsule designs. Like the trans-dermal chips, different organ systems could be included to study toxicity and clearance. A functioning lung-bronchi mimic could be connected to a vascular system for the testing of medicines for diseases such as asthma. Once could envision a chip where a vein could be used for a one-time drug injection or a continuous drip such as in chemotherapy. Toxicity levels in the liver, kidney, brain, spleen, blood etc could be monitored and analyzed in real time to determine the optimal delivery rate of the drug. Another platform for drug development has been the engineering of tumors.6,7 Bioprinting techniques are being utilized for the fabrication of tumor constructs onto which cancer treatments can be tested on. One can envision that patient-specific tumors could be fabricated that could be utilized to develop a more personalized treatment regimen. This could be extended to “Organ on a Chip” systems where a tumor is added to the specific organ it is afflicting. A lot of interesting research being conducted and potential treatment breakthroughs with bioprinting! Exciting times ahead! Mullard, Asher. “New drugs cost US $2.6 billion to develop.” Nature reviews. Drug discovery13.12 (2014): 877. Rubin, Eric H., and D. Gary Gilliland. “Drug development and clinical trials—the path to an approved cancer drug.” Nature reviews Clinical oncology9.4 (2012): 215-222. Bhise, Nupura S., et al. “Organ-on-a-chip platforms for studying drug delivery systems.” Journal of Controlled Release190 (2014): 82-93. Huh, Dongeun, et al. “Reconstituting organ-level lung functions on a chip.” Science328.5986 (2010): 1662-1668. Lee, Jong Bum, and Jong Hwan Sung. “Organ‐on‐a‐chip technology and microfluidic whole‐body models for pharmacokinetic drug toxicity screening.” Biotechnology journal8.11 (2013): 1258-1266. Burdett, Emily, et al. “Engineering tumors: a tissue engineering perspective in cancer biology.” Tissue Engineering Part B: Reviews16.3 (2010): 351-359. Gill, Bartley J., and Jennifer L. West. “Modeling the tumor extracellular matrix: Tissue engineering tools repurposed towards new frontiers in cancer biology.” Journal of biomechanics47.9 (2014): 1969-1978.